I love this book! Therefore, I must say a few words about it. Growing up, I heard about the Knights of the Round Table, Camelot, The Sword in the Stone, Merlin, Guinevere, Arthur, Lancelot, and Tristan and Iseult but was not really too familiar with them or anything else about that time. Possibly because I am American, I have never really been into the whole Arthur mythos. It sounded like something I would like but just couldn't get into it. As a young adult, I made an attempt to read The Once and Future King but after a few chapters lost interest. I tried again a few years ago, same thing. I tried numerous other modern retellings but did not complete any of them. I continued to not really care about any of it. 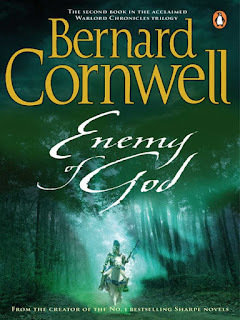 Then someone responded to one of my blog posts and mentioned that Bernard Cornwell wrote "a magnificent trilogy" about Arthur and it was recommended to him as a fan of A Song of Ice and Fire. Well, I was familiar with Cornwell and so I thought if his Arthur books was favorably compared to ASoIaF I should give it another try. I began researching, as I always do when I am interested in a book, and decided it might work for me. I am a quick and impatient reader. I tell publishers and authors that I often choose to not finish a book because I no longer force myself to read books which don't interest me or connect for me whatever the reason. There is too much to read and I have to much to do to read something I don't enjoy. So that is why I thoroughly research a book before I purchase it, request it, or check it out from the library. One thing which I will put a book down for is lack of care about the characters. If I am reading a story, no matter how much action it has or how well written, if I don't care about the characters, for good or bad, I stop reading it. I normally know by 100 pages or so but I don't have a "rule". Once I realize I could care less what happens to a character or characters, I give the book a last chance, maybe 15-20 pages, to connect or I am done. And I probably stop a third of the books I meticulously pick out. I mention all this because this is one of the best character driven books I have ever come across. Someone said that this is the book they had been searching for their whole life, it was that good. I couldn't agree more! In all my years of reading, I can't recall a book with so many great and memorable characters, except perhaps in classic literature. The characters were all very flawed, just as humans are. The apparent contradictions in their behaviors and what they said and then did reminded me of myself and every other person I have met. As did how they gave lip service to oaths and justice but then acted on their emotions. This is a dark, brutal, and tragic tale full of heroism, love, and romance with many more themes of revenge, justice, war, human nature, peace, and many more. There are many other layers in this story such as the battle between Druidism and Christianity and between the Britons and Saxons as well as all the political intrigue and treachery among the Britons. The history and lore is deep and dark, going back to the time of the Romans conquering the land. The magic was of a sort I can't really do justice to. It seemed so real yet foreign to what we generally think of as magic. There was a large cast of characters and an epic plot but because of the writing and wonderful development, I was never lost, never confused, and never bored all three of which generally happen to me from time to time in books with many characters and epic plots. I like books that are clever and the plot here was one clever idea after another, twisting and turning and doing what I never expected. Bernard Cornwells writing is top of the line. I generally don't care for descriptive writing but he brought this time period to life for me and I soaked in each city, town, castle, and temple he described as well as the character descriptions. The story was an emotional roller coaster as well, bringing you high with victories and justice and low with sorrow for the terrible tragedies that befall these characters. The author mentions how he made this story his own, taking bits and pieces of the amazingly complex and convoluted Arthur legends. I have no idea how it holds up to the history of either the real or mythological Arthur. I don't care either. This is an amazing book, one of the best I have ever read. The Winter King, book 1, was an awesome book but this one was even better. This is historical fiction at its best. Even if you don't care for the Arthur legends, you should still read this as an awesome story. I do love my country but what beautiful history does Britain have! I have to admit I am jealous. The United States has a history of a couple hundred years compared to Britain which has a couple thousand years of history. And this book brings to life that time about 1600 years ago.